Dovewing? Comes to think of it, she was kinda childish. I don’t know AppleBreeze? I’m not sure. I’ve never thought about it. I suspect ThunderClan because he seems quiet an ambitious cat. Would RiverClan be too laid back for him? i think Stormfur prefer ThunderClan. I remember in Cats of the Clans under His page, stated that he never forgave RiverClan for what happens to him and Feathertail during TigerClan though he would fight just as hard for his clan. Add the fact that RiverClan Exile Stormfur and Brook for a simple mistake and a “omen” that not even the medicine cat was sure about. He may not be as keen to join up with it again. At least with ThunderClan he only has to deal with question of his loyal that actually make sense, he may have been born in ThunderClan by the former Deputy but he was raised in RiverClan and associate with them far longer than ThunderClan and as well as turning his back on Clan life to live with Tribe. I bet if Stormfur was around for Eclipse, there would no more doubt on his loyalties. 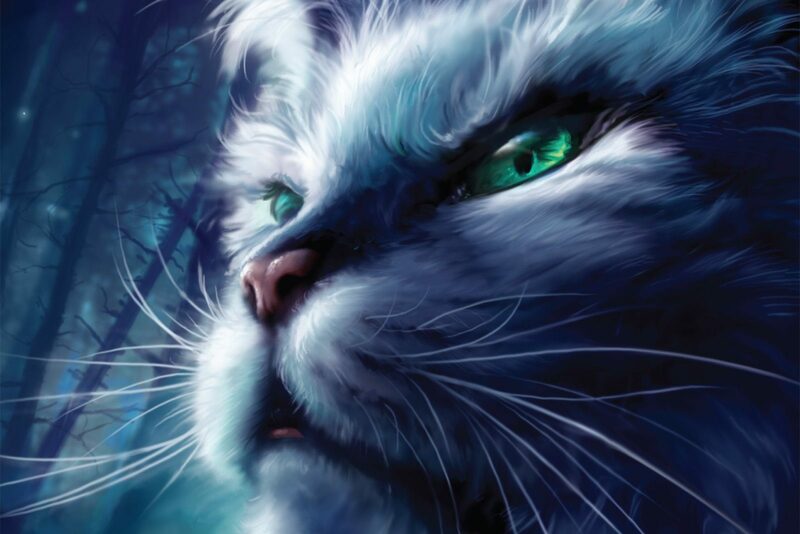 I have come to like Oakfur of shadowclan a lot, but where is his family? 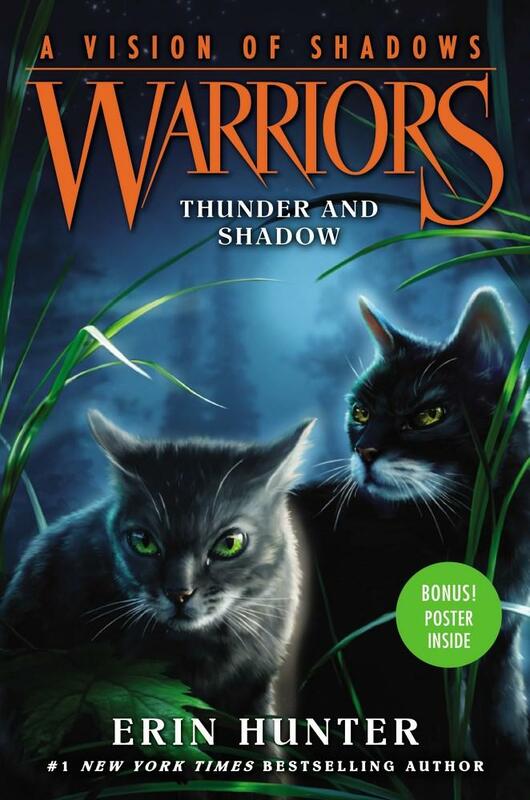 On the cover of Shattered Sky, those cats are Hawkwing and Pebbleshine! And it’s called Shattered Sky because all of SkyClan manages to find their way to the Clans and join back together. But before Hawkwing’s group got there, Pebbleshine was there and found another Clan and joined them, and the cover is of the mates looking at each other as enemies. Well, Hawkwing has amber eyes and is dark gray, so I suspect that isn’t him. The illustrators have made mistakes before. 🙂 Also, the light is shining directly on them. But it probably isn’t him anyways. Yeah. This is a great theory! The cats actually might be Twigpaw and Violetpaw (AGAIN) now that I come to think of it. Like you said, the light is shining directly on them, so the black on Violetpaw would look dark brown. And Twigpaw is gray with green eyes. Well…I think Violetpaw has more black on her. So we shall have to see. Those cats are Darktail and Needletail. I am so up late but I am going to talk about Needletail, Darktail and Violetpaw. Needletail is a rebel and she and Rain are maybe going to be mates but I hate her so much cause she maunipulate Violetpaw to think she and her are better sisters which they are not kin then Twigpaw who is more caring and who is a better choice. I think that Needletail is trying to make Violetpaw to believe that they are close like sisters and that the rouges are better. I don’t think it’s that unusual for a rogue to come up with the idea to mash two words together to make a name for their kits. It’s not such a unique and hard to come up with idea that only the Clans could have ever thought of it. 😛 Rainfur and Nightheart were born rogues as well, but they had Clan-style names. What?! I love Needletail! Sure she’s an antagonist but she does want to have a true relationship with Violetpaw! She’s just not very good at it! She seems more manipulative than genuinely friendly to me. She made it seem like Violetpaw was a traitor for wanting to leave a group where the leader punishes cats by scarring them violently if they talk out of turn, and she guilt-tripped Violetpaw into staying with ShadowClan when the rogues took over. It doesn’t seem like a very healthy friendship to me. Yeah, it’s not but you can see Needletail genuinely cares about Violetpaw, taking her on as an apprentice, taking her to Twigpaw, taking her to the rogues with her, asking her to stay in the new ShadowClan with her, being hurt when she left the rogues unexpectedly, promising to be her friend, playing with her. Of course she’s also being manipulative because she’s kind of selfish-ish (for lack of a better word) but the guilt-tripping was because she Violetpaw to live close by her. She was even shown to keep promises for Violetpaw (the whole hunting rabbits thing) when she wanted to be with Rain. She’s trying to do the right thing in their relationship (not all the time but surely at least as many times as she’s not trying to) but most of the time isn’t doing it the right way. This might have something to do with how Needletail has a very rebellious and defiant attitude. Gotcha. ^^ I liked Needletail in The Apprentice’s Quest because she seemed cool and rebellious, and was willing to question the warrior code and authority in ways I thought were interesting and relevant. But there’s a difference between being rebellious and cruel, and she crossed that line for me when she was totally cool with living in a group where cats don’t look after each other, and the leader scars and almost kills cats for talking out of turn. She crossed that line even more for me when she was willing to help that cat take over ShadowClan and drive out the loyal cats. I think she crossed that line because she was blinded by a crush and what seemed like the steps to her utopia… she can’t see it’s not yet. And she wants to achieve this ‘utopia’ at all costs because she believes it’ll be better for everyone. This conflict just made her seem very real and interesting to me, as an antagonist. I’m really excited to see where Needletail’ll go in AVoS because she has so many alternate destinies! If she can’t see the faults in a group where the cat she has a crush on had one of his eyes torn out by his leader for talking back, then she’s either a fool, or she doesn’t care about the cruelty of that group. 😛 I dunno, I just can’t see any way to view her in which she comes out as good or sympathetic, at least not after joining Darktail’s group. I think he’d stay with the majority of his Clan. I like him, but I don’t remember him as an outside-the-box thinker. I also have a other question is that did you guys kill off Brokenstar, Tigerstar, Hawkfrost, and Shredtail’s spirits to make way for newer villians and that these old bad guys won’t keep popping over and over again but you let some bad guys still haunt the Dark Forest like Mapleshade, Darkstripe, Thistleclaw, Snowtufff and more so you guys don’t kill almost every old bad guy. Kate, what is Dawnpelt’s eye colour? We know the eye colours of her brothers and her parents, but not her. And I’ve always been curious. EDIT: I personally like the idea of her having green eyes, like her parents. And don’t forget the similarities to Leafpool’s litter. Jayfeather and Flametail have blue eyes. Lionblaze and Tigerheart have amber eyes. Pop up with a question: Which one is older between Alderpaw & Sparkpaw? Or is it still unknown/undecided? And, well… which one is older, Twig or Violet? Perhaps I was in a hurry yesterday, but I’m asking this because in Chinese, we usually explicitly distinguish between “older brother” or “younger brother” when we say “brother”; so is “sister”. For example, it seems that the translated edition of PO3 has assumed that the Three, listed from older one to younger one, are Lion, Holy, and Jay, while we can infer from Leafpool’s Wish that the order of birth should be Holy, Lion, and Jay. Thus Lion should have called Holy as his “older sister” rather than “younger” one. Though actually this problem could be evaded, the result might not be satisfactory enough; it would be like evading personal pronoun or using gender neutral words when we don’t know one’s gender. That sounds super-complicated. I hope it’s something that the translators/Chines publisher will manage – all they need do is decide the exact birth order of each character when they first appear and make sure they refer to them consistently throughout the rest of the translation. Okay, I see. So I’ll wait for the publication of translated edition. Thank you for the clarification, Kate! My question is about Bumblestripe’s eye colour, so what do you think it should be? Personally, I thought of warm, dark yellow eyes, like a bumble bee 🙂 That matchs his name…. I wish you a nice (maybe snowy?) evening!